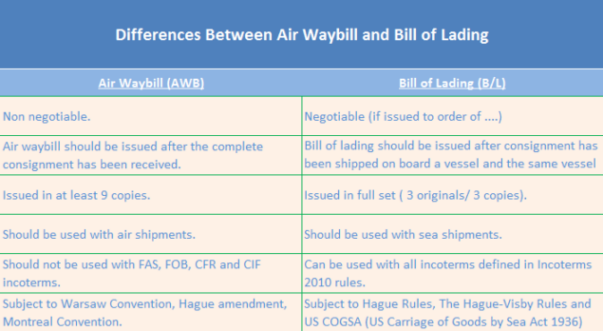 What are the differences between air waybill and bill of lading? Bill of lading and air waybill are two transport documents, which have been widely used in international trade businesses for decades. Air waybill is a transport document, which is used in airport-to-airport air shipments. Bill of lading is the generic name of transport documents, which are generally used in port-to-port sea shipments. 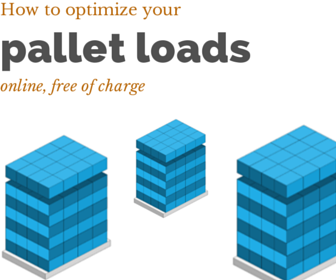 There are various types of bills of lading available on the market, each of them fulfilling different needs. Today I would like to mention the differences between these two important transport documents. Document of title, issuance time, how many originals and copies issued, mode of transport, applicable incoterms, governing international regulations. Bill of lading, when issued in negotiable form, represents title to the goods. For this reason at least one original copy of the bill of lading must be surrendered to the carrier's nominated agent at the port of discharge in order to collect the goods. Air waybill, on the other hand, is always a non-negotiable transport document. Buyers could collect the consignment from the carrier at the airport of destination by simply proving their identities against the company information stated on the consignee part of the air waybill. Bill of lading should be issued by the carrier, after the goods shipped on board a vessel and the vessel departures from the port of loading. Air waybill should be issued by the air cargo carrier, after the complete consignment has been received by the carrier and the aircraft departures from the airport of departure. It is a standard practice in international container transportation to issue bills of lading in full set, 3 originals and 3 copies. 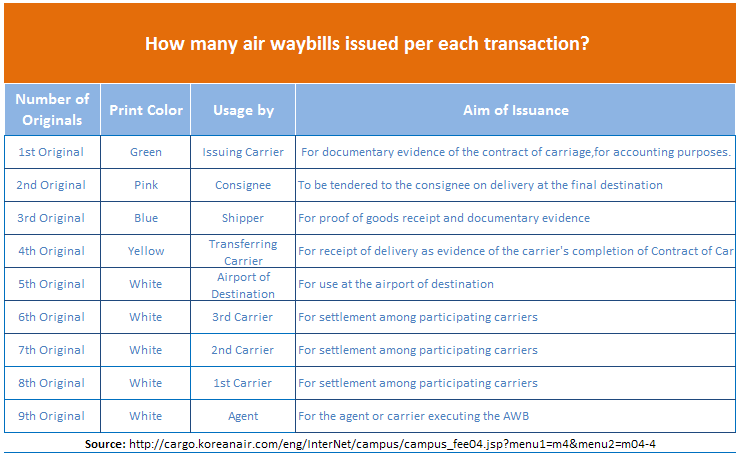 Air waybills, on the other hand, issued by the air cargo carrier in 9 originals. Bill of lading should be used with port-to-port sea shipments, whereas air waybill should be used with air shipments. Bill of lading is a transport document, which is issued in sea shipments. According to Incoterms 2010 rules all incoterms can be used with sea shipments. On the contrary, air waybill is a transport document, which is issued in air shipments and FAS, FOB, CFR and CIF incoterms cannot be used with air shipments according to Incoterms 2010 rules. Bill of lading and air waybill are issued subject to different governing international rules. Governing International Regulations of Air Waybill: Warsaw Convention, Hague amendment, Montreal Convention. Governing International Regulations of Bill of Lading: Hague Rules, The Hague-Visby Rules and US COGSA (US Carriage of Goods by Sea Act 1936).